For some time now I have been unhappy with the state of my study. 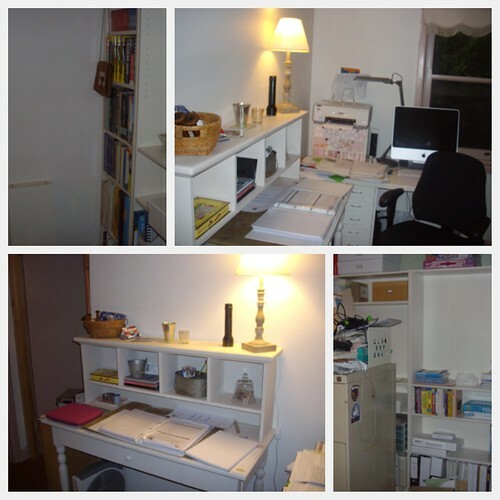 I promised myself that for a significant birthday, I would have everything organised and put away properly, but I was never really happy with the layout of the study. So over the Christmas break, I emptied the study of everything in it, changed the bookshelves from the Ivar ones we had been using for years to the Billy Bookcases (also from Ikea), and moved everything about. At the moment this room is still a work in progress, and I can see a room that is a pleasure to work in happening here, but for the time being, I still have more paper STUFF to work through. The white desk is almost how I want it to look. I would love a different chair, but I don’t want this room to be too cluttered. I still need to work out how to position the printer. It would be great if I could set it up wirelessly, but at the moment, that does not look like it is going to happen. The bookcases are partially empty, as I go through the paper work that was removed from here, but it is looking like I will be able to move the business related books I have collected over the years into here from the ‘library’. Do you see the filing cabinet sitting in the middle of the floor? It has been here since early January. The reality is that it has rarely been used since we moved home. I have come to the conclusion that filing cabinets and I do not exactly work well together. P is planning to use this filing cabinet in his shed as a secure, dry place to store some of his tools. I have a couple of Tullsta arm chairs (also from Ikea) in the front room. I want to replace these with some linen covered wingbacks, but the Tullsta chairs will make their way into the corner of this room, making it a nice place to sit and read, maybe I can get it done in time to read my Hello Soul, Hello Business coursework here. Like many, I tend to look at the decorating blogs of many talented home decorators, but one talented home decorator who has inspired me for far longer, is my good friend Wendy. 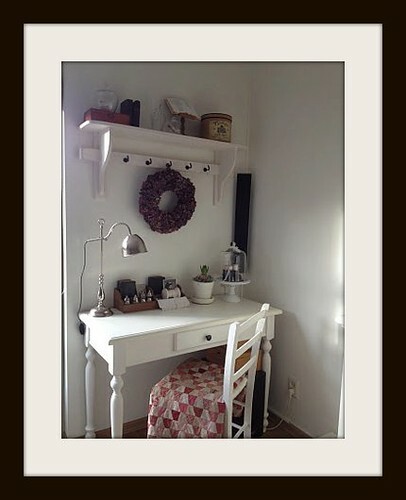 It is her desk vignette that has inspired me with setting up a working room.